In December, we took a data-driven look at a handful of common assumptions about how musicians make money: that they’re rich; that they make all of their money from touring; and that they don’t make any money selling records. Our final stop in this series looks at the meme that “musicians make all their money selling t-shirts.” As with other issues that we’ve tackled in this series, there is a grain of truth to this. Let’s face it, in a world where sound recordings are ubiquitous and low cost/nearly free for consumers, some bands have turned to making money on things that are either tangible, unique or exclusive. This includes merchandise, licensing your brand or likeness, or endorsing some product. But how important are the merchandise and branding revenue streams? And are they changing over time? On the Money from Music survey, we first asked respondents about income from merchandise sales, such as t-shirts, posters and apparel. Then we asked some separate questions about other sources of income related to their brand. We also discussed these revenue streams with all our interviewees, and captured data about merchandise and brand income in the financial case studies. For the 5,371 respondents, the aggregated percent of income derived from merchandise – that’s non-musical items like t shirts, hats and posters – in the past 12 months was 2%. On the aggregate level, income from merchandise is the smallest bucket; less than the percent of income from performances (28%), sound recordings (6%) or compositions (6%). Look at our full blog post for data broken down by role and genre. 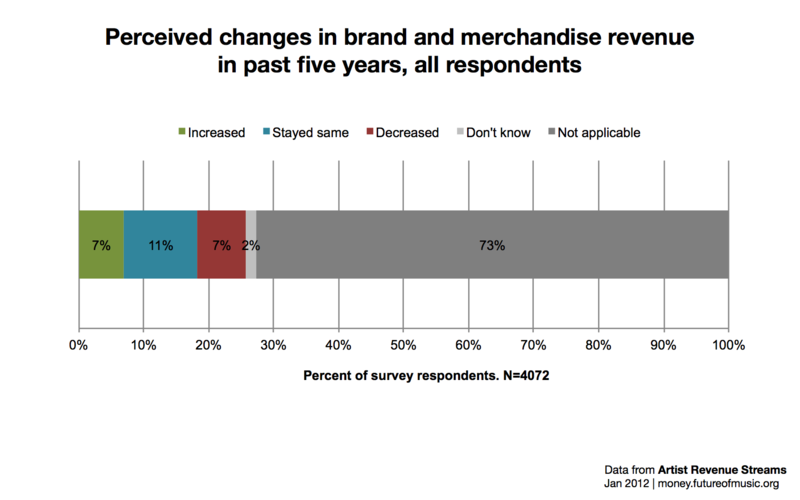 We also asked about perceived changes in merchandise revenue over the past five years. The data indicates that this income source hasn’t changed much. But, for about 73% of survey respondents, the question about merchandise income was “Not applicable” to their career trajectory. This underscores the fact that are survey population includes composers and songwriters, salaried orchestra players, session musicians and teachers – all of these being sectors in which merchandising and branding are not typically part of their revenue picture. The top-level survey data suggests that income from merchandise is only relevant for a limited number of musicians. And even for these musicians, income from merchandise is a small piece of most musicians’ revenue pies. While merchandise sales is the most common source of income related to an artists’ brand, we asked about other brand-related income as well – everything from grants to money from acting. About 10% of survey respondents had earned some income from grants in the past 12 months. This can be money from a state or local arts council, or a private foundation. About 5% of our survey respondents have received some income from fan funding in the past 12 months. This can be direct appeals to an existing fan base, or they can be managed through sites like Kickstarter or Pledge Music. Lower on this chart are revenue streams where leveraging your brand takes a certain amount of pre-existing fame. The fact that only a small percentage of survey takers have earned money from, say, persona licensing, shouldn’t be a surprise given the high hurdle it takes to get there. And, for some of these revenue streams – corporate sponsorships and product endorsements, for example – it might be that the individual musicians don’t see that money in their pockets, but that the money pays for tour expenses or provides them with free goods (drum heads, cymbals) in exchange for their support. The possibilities of artists making income from their brand have vastly expanded over the past ten years, as more advertisers, lifestyle brands, beverages, video games and beauty companies have turned to musicians to endorse or represent their products. But looking at our data, participation in these ancillary revenue streams is limited. And, if they are participating, it’s probably not flashy things like promoting their own Tequila or endorsing Rolex watches, but receiving a grant or financial support from their fan base (both of which have their own costs). The data about branding suggests that there are more opportunities for musicians, but widespread participation in these new revenue streams remains limited. So, are musicians making all their money selling t-shirts? If we’re just talking t-shirts and posters, the data suggests that income from merchandise is a small piece of the pie, and only relevant for a small number of musicians. 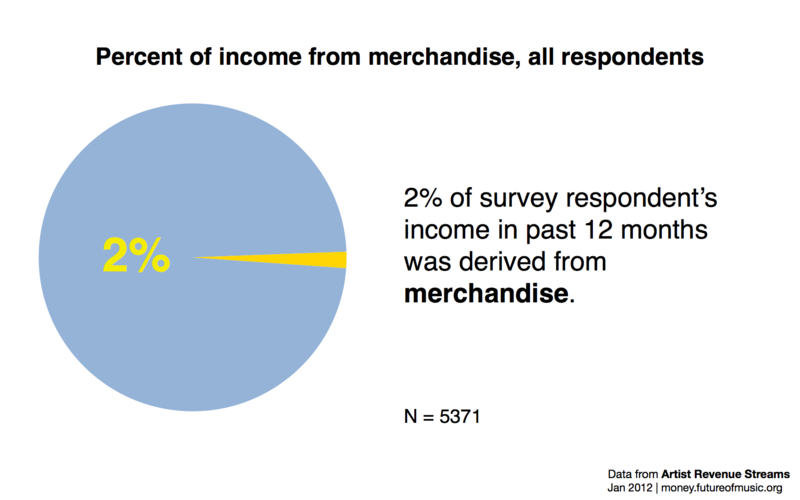 In aggregate, income from merchandise only accounted for 2% of survey respondents’ income. Even looking at differences by role or genre, the percent of income attributed to merchandise sales remained small. 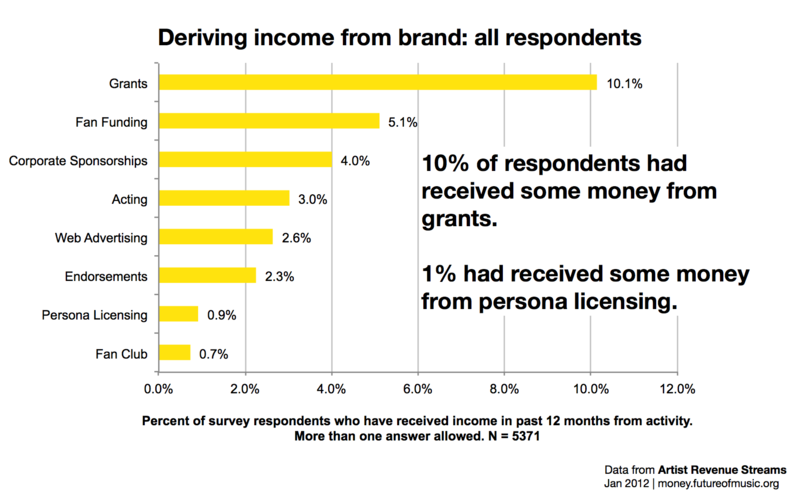 But, the survey data also examined the range of other sources of brand-related income; everything from grants to persona licensing. Just how much money artists or bands can make on their brand varies a lot based on role, genre, career profile, and other criteria, but the qualitative and quantitative data collected suggests that there are more opportunities for musicians to leverage their brand, but widespread participation in these new revenue streams remains limited. A third takeaway relates to the momentous changes in the larger music ecosystem. Changes in label income have reduced label advances, tour support, and budgets across the board. As a reaction, bands and artists have turned to new sources of support for recording projects or tours, whether through fan-funding sites, grants or corporate sponsorships. Many of our interviewees talked at length about how they were leveraging their brand to make more money, which you can read about here. Even ten years ago, some of these strategies were either unheard of, or impossible for anything but mega-stars to pull off. But the data suggests that, for more and more bands, corporate sponsorship and fan funding is filling in where traditional revenue sources and label support have dropped off. One of the key reasons that Future of Music Coalition embarked on this Artist Revenue Streams project in 2010 was to bring some tangible data to the ongoing debates about copyright, compensation and creativity. The mythbusting series used qualitative and quantitative data collected in this project to examine four of the common assumptions about musicians and money: that they’re rich; that they make all of their money from touring; that they don’t make any money selling records; and that they make all their money selling t-shirts or merchandise. As stated throughout this blog series, each of these assumptions is based on a grain of truth. What usually makes them incorrect is thinking that (1) all musicians operate under similar conditions and that (2) the existing music ecosystem is now so broken that traditional revenue streams based compositions, sound recordings or performances no longer work or generate any value. Neither of these are true. And it’s when we get into these “all or nothing” ends of the debate that we run into trouble. As much as we all desire easily digestible facts or a way to describe “typical” musicians, real life is much more messy and complicated. And if we want to truly understand change, we need to acknowledge the complexity. We also hope that readers better understand the true diversity of the American music landscape. There is an army of musicians – from composers, to salaried orchestra players, to session musicians – that have career structures that are not easily supplemented by t-shirt sales or other ancillary revenue streams. This should in no way diminish their value or importance; we simply need to remember that the community of creators is large, diverse, and specialized, and does not lend itself to one size fits all solutions. Will this mythbusting series put these debates to rest? Probably not. But we hope that the data provides musicians, advocates and fans with a better sense of the changing nature of the music ecosystem, and some data to reference in ongoing conversations. Stay tuned for more reports based on the Artist Revenue Streams data in spring 2013. Sign up to receive Artist Revenue Streams email updates here.